Ankara, Turkey 29 Jan 46 Dearest Dorothea: Enclosed is the envelope sealed by the military censor in which I carried my personal records across the Atlantic Ocean twice by plane and which I would like to preserve as a souvenir of such a trip. My office is still cold although they now have the fire going feebly. Hope it improves before I freeze to death. How's everything in good old Burlington? I put in my request for you and the kids to be sent here within three months - in which event I will stay in the army until June 30, 1947. 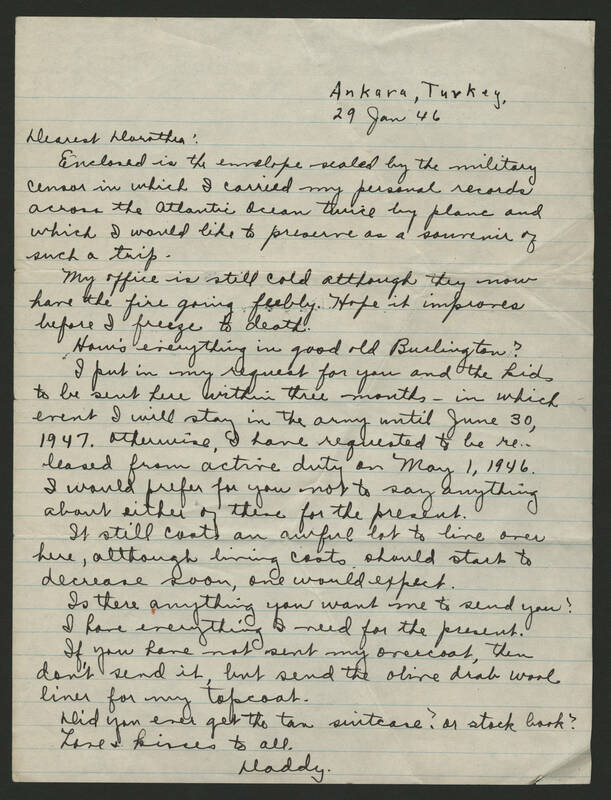 Otherwise, I have requested to be released from active duty on May 1, 1946. I would prefer for you not to say anything about either of these for the present. It still costs an awful lot to live over here, although living costs should start to decrease soon, one would expect. Is there anything you want me to send you? I have everything I need for the present. If you have not sent my overcoat, then don't send it, but send the olive drab wool liner for my topcoat. Did you ever get the tan suitcase? or stock book? Love & kisses to all. Daddy.